From East or West on Interstate I-90, take Interstate I-29 South to Highway 38 (60th Street). Head East on Highway 38 to Westport Avenue, where you will turn right (south) at the stop light. Head south on Westport Avenue. The Sanford Sports Complex will be on your left. The Scheels IcePlex is located North of the Sanford Pentagon. From North or South on Interstate I-29, take the Highway 38 (60th Street) exit. Head East on Highway 38 to Westport Avenue, where you will turn right (south) at the stop light. Head south on Westport Avenue. The Sanford Sports Complex will be on your left. 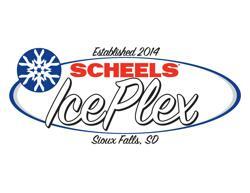 The Scheels IcePlex is located North of the Sanford Pentagon.